The forces of gentrification may have made dive bars a rare thing in urban India. Sipping on finely-crafted cocktails or clinking glasses has its charm but when you just need to kick back at your fave no-fuss spot and have some wallet-friendly booze with your squad, head out to one Kolkata’s legendary old bars with oodles of atmosphere. Their customers list reads like the Who’s Who of old Calcutta. Located in Bowbazaar, Broadway is a 5-minute walk from the Chandni Metro. The bar is attached to the old and atmospheric Broadway Hotel. With half whitewashed and half brick red walls, French windows, high ceilings and wooden interiors, Broadway exudes an olden-day charm. Water’s served in Old Monk bottles, and you won’t get any music here so you don’t have to struggle to have a conversation. 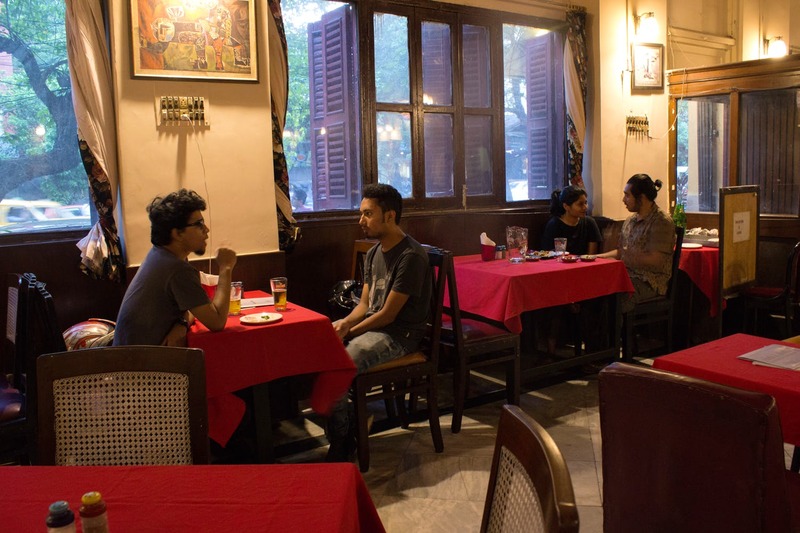 It’s a great place to catch up with a friend over beer (starting at INR 125). You get great finger foods (try the kebabs), and if you are up for it, mains as well. Students, working professionals, media people, and tourists, Broadway is popular with everyone. They have had legendary footballers as guests, and if it is not busy day the waiters may even tell you a few stories if you ask them. While talking about old bars, we can’t leave out Chung Wah. Along with good cheap alcohol, Chung Wah also serves great Chinese food. Order a beer (starting at INR 160) with some finger food to go with it and park yourself on one of their old makeshift cabins with your friends. Interestingly enough, all the cabins have names based around love – so you can choose from Prothom Prem (first love), Kichukhon (for some time), Bhalobasha (love) and more. Sorry ladies, but you will have to sit this one out. Chotta Bristol is kind of a hidden gem, located near the Esplanade crossing, inside a small lane. And they allow only men. With whiskey starting at INR 57 (30ml) and beer at INR 115, they have a large number of regulars. So make sure you get there around 5 pm to find yourself some place. Shaw Brothers is loud, and you are bound to meet a lot of drunk men here, but this place will remind you of Old Calcutta. Lots of charming idiosyncrasies here – which may remind you of Bombay’s Irani cafes. They stop service from 6pm to 6:15 pm because they do a daily puja; the menu is on a LED board and they expect you to know what you want to drink (don’t mull too much when the waiter’s at your table); they don’t serve food (but right outside are several shops that serve chaat, chilli chicken, mutton bheja fry – from INR 30-80). When we talk about cheap drinking in Park Street we must mention our trusted old-school bar, Olypub. Their famous beef steak (INR 225) is perfect to wash down with some beer (INR 190). It was revamped after a recent fire in 2014. On most weekends you will have to wait for at least half an hour to get a table (sometimes weekdays too!). You may also have to share a table with others, but that is all a part of the experience. With legends like Uttam Kumar and Satyajit Ray, Olypub has become synonymous with Kolkata. New Empire is right above what used to be the single screen New Empire cinema. They serve an array of drinks with beer starting from INR 175. They have revamped their look a bit. They serve a variety of vegetarian and non-vegetarian options (starting from INR 134) to make sure you don’t drink on an empty stomach.